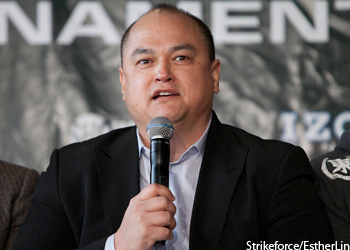 After battling the UFC for several years, Strikeforce CEO Scott Coker finally waived the white flag over the weekend. Although he and his new partners have remained mum since dropping Saturday’s bomb, the execs for the world’s biggest, baddest and revamped mixed martial arts machine have just issued a statement regarding the monumental purchase. “This is an important day for the sport of mixed martial arts,” Strikeforce CEO Scott Coker stated. “We are excited to work with Lorenzo Fertitta, Frank Fertitta, Dana White and everyone at the UFC on the quest to make MMA the biggest sport in the world. Under the terms of the deal, all current Strikeforce fighter contracts will be honored, as will its broadcast agreement with Showtime Networks, Inc. Strikeforce will continue to operate as a completely separate business, with Coker maintaining his post after inking a long-term employment agreement with Zuffa, LLC. Strikeforce holds roughly 16 events annually across the United States. Those plans won’t change under the new ownership. However, fans won’t be seeing any athletes on Strikeforce’s current roster inside of an Octagon anytime soon. Once present contracts expire, UFC and Strikeforce fighters are free to negotiate new deals with whichever promotion courts them. “We intend to operate Strikeforce as a separate business much like we did with the WEC for many years,” Lorenzo Fertitta, Chairman and CEO of Zuffa, said. “We look forward to working with Scott Coker, and the entire Strikeforce and Showtime teams to continue to provide quality content for mixed martial arts fans. Strikeforce was represented in the transaction by Evolution Media Capital, a media and sports investment bank affiliated with Creative Artists Agency.